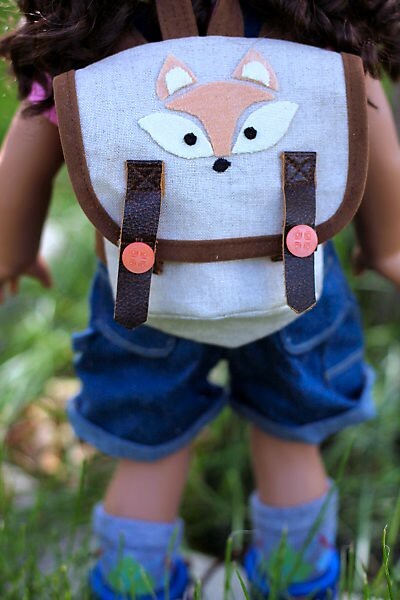 I made yet another backpack to take photos for a tutorial and sew along. Taryn (American Girl #44) has laid claim to this one. I made this version with no slider or buckle closure, just to be sure there would be an option for you if you couldn’t find buckles or sliders. The closure is simply Velcro, with decorative buttons. I suppose you could make them workable buttons with buttonholes if you are super ambitious! I used linen fabric for the body of the backpack this time, backed with a medium weight fusible interfacing. I added a fox applique with scraps of dyed wool from my stash. I used Steam a Seam 2 fusible web to make the applique super easy to apply. Craft or wool felt would also be perfect for this applique. When you click this link, the pattern should open in your web browser, but (this is important) when I printed the pattern directly from my browser, it printed smaller then actual scale. In order to print the pattern at the correct size, be sure to download the pattern to your computer, open from a pdf viewer (I use Adobe Acrobat, which is free), and print from there. Be sure to choose the option for “Actual Size” when printing. To double check sizing, measure the 1 inch box printed on the pattern. If it measures 1 inch, you’ve got the right size!